We hate the distance. We hate our new duty station. We normally hate that or do not like that the military has that way of entering its way into our marriages. No marriage is the same. What one person wants in a marriage is not always what another person wants. Our faith, upbringing and personalities can play a vital role in how we think our marriage should be. I like to think the military is a microcosm of the United States as a whole. We come from different backgrounds, have different passions, different jobs and all end up in the same place. It is one of the great things of the military but also one that shows that we are not all the same person no matter what our spouse's occupation is. Civilian marriages and military marriages go through many similar issues. The issues range from lack of communication to infidelity. The root of the issue will stem from different things for every marriage. But is the solution to these problems the same for military and civilian marriages? I say yes. Getting into the nitty gritty details of any marital issue can be painful no matter what your spouse's occupation is. The most common issues I have seen and experienced in military marriages stem from time apart. Being separated for weeks, months and even years at a time can be excruciatingly difficult on a marriage. Deployments add an extra amount of fear of the unknown and can leave you up at night wondering if your spouse is okay. You know that there are marriages which day by day becomes happier because of time apart; and some are destroyed. 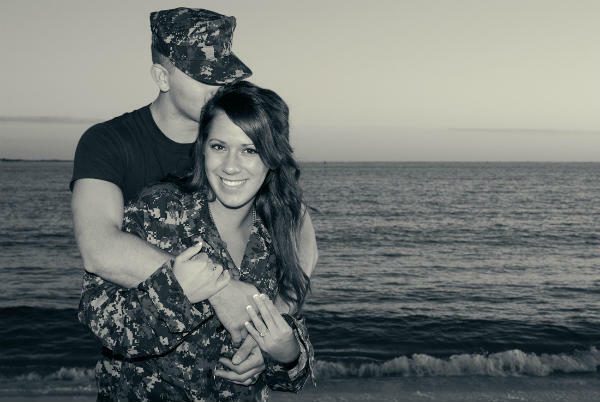 Military marriages are not the only marriages that grapple with distance and fear of the unknown, and military relationships can feel isolating at times. But do we sometimes fall victim to isolating ourselves? The specific situations could be different but are civilian marriages really that different? You could be the wife of a truck driver, doctor or a police officer and I bet the pain of time apart feels the same. What about the civilian versus military divorce rate? The divorce rate for male military persons was 2.6 percent and it was 6.6 percent for female military members. So ask questions to girls and boys before marriage to get to know each other very well. The Marine Corps was the only branch that saw an increase in divorce in 2016. The Center for Disease Control reports that the divorce rate in the United States was 3.2 percent in 2014. Although that rate is measured differently than the military rate and doesn't take into account several states, including California, it's clear that the divorce rate difference between military and civilians is not as drastically different as widely thought. The best advice is usually from professionals, both in the military and civilian world. Military Family Life Counselors provide non-medical counseling to military members and their families. Marriage counseling is offered in addition to individual counseling. If you choose to seek advice and counseling I also highly recommend seeking a licensed therapist, psychologist or counselor through Psychologytoday.com or Military One Source. There are many fantastic resources available both in the military and civilian world that can benefit any relationship.